We took this camera along to a skittles match... a match in which your reviewer's mother was taking part. "Did you bring your camera?," she asked. Her face fell when the PowerShot A620 appeared. Perhaps she was expecting something slimmer and more pocket-sized. However, this is one hunky camera that fights its corner well with 7.1 megapixels, a 4x optical/16x digital zoom and a 2.0-inch flip-and-twist LCD. Indeed, the LCD screen is a perfect size: not too big, but large enough for checking sharpness and exposure. In fact, the only disappointment of the evening came from the low-light images. However, we suspect this may have had more to do with the fug of cigarette smoke in the skittle alley rather than any problem with the A620's abilities. There is a sturdiness to the PowerShot range that takes on more significance with the passing of time. It's good to see that there's been no compromise with the build quality. For instance, the screen mechanism is faultless and there are no fears that it will snap off or suffer any of the problems found with pullout components on cheaper digital cameras. If there's one compromise with the A620 then it's the question of power. The camera uses four AA batteries. Of course, some people like that sort of flexibility but we've never been huge fans of AA cells, simply because power consumption and running costs usually tend to tower over rechargeable Lithium-Ion batteries. However, despite our reservations about the batteries, the power consumption is very, very impressive. Our batteries only started to lag after we'd taken a few hundred shots. Of course, another upshot of the AA batteries is that this is a weighty camera. The A620 steams in with a feature set as long as your arm. Over 20 shooting modes are all available from the mode dial atop the middle of the chassis, while a 1cm Super Macro mode produced some stunning results, as you can see on the right. The extensive shooting modes include Shutter and Aperture priority settings as well as Custom and Manual modes. As on other Canon DIGIC II based cameras we've seen so far, the scene modes give superb results, with the Night Mode particularly effective in situations where one or two bright lights would usually fill your image with glare. This is a camera that demands never to be left on the Auto setting; to do so seems something of a waste when there is so much to be discovered. Unusually for a compact, the A620 has a removable fitting ring that enables you to fit optional lenses - the WC-D58N 0.7x Wide and TC-DC58N 1.75x Telephoto (around £70) to widen or magnify your shots. It's a handy feature and great for travellers. Shutter response is average and similar to other PowerShot models at around half a second. If we're being picky, we'd fault the lowlight operation. Noise starts creeping into the image, as you can see with our picture of London's Paddington Station above. It's true that reduced light operation is better than with older Canon image processors - and better than many more expensive compact competitors - but the best results are achieved using the scene modes - better than leaving the camera on Auto even. You can see this in the picture of the cycle opposite. We were also a little disappointed with the flash. It isn't as harsh as many, but the red-eye reduction is fairly ineffective - we found that retouching was necessary with many images. The closest competitor to the A620 from Nikon is the CoolPix 7900 - a recipient of our coveted Gold Award. The 7900 has the same pixel count but the Canon can boast a price advantage. Both provide remarkably sharp images with plenty of flexibility. 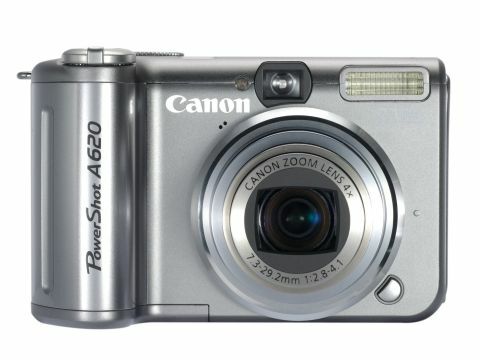 It can sometimes be tricky to predict who exactly Canon is aiming its PowerShot models at. Here, though, the aim is clear as can be. Do you want a feature-packed camera with controls you can actually use without having the fingers of a one year-old?